CPSIA - Hypocrisy Contest, We Have a WINNER! No one beats Congress at being hypocritical. In this case, please note the valiant efforts of two Congressmen to preserve the rights of National Park Service employees to use lead bullets and lead tackle in our National Parks. "Sports, conservation and gun rights groups had not been consulted, and they condemned the idea." Good news, however - the National Park Service has no intention of restricting you and I on the use of lead ammo or tackle, just their own employees. You see, poisoning is apparently not possible from recreational use of these materials. It is only through recreational use of rhinestones, library books, ballpoint pens, ATVs and electricity kits that serious health issues are possible . . . . Sure. With about two weeks to go before implementation of the tracking labels requirement under Section 103 of the CPSIA, I thought it would be appropriate to continue to detail my comments on the new guidance issued by the Commission last week (the Guidance). Why the Delay in Issuing Guidance? The Guidance came out late, with only days to go before implementation on August 14th. By voting on the Guidance on July 20 without previously releasing it, the Commission issued the Guidance in "final" form, although Commissioner Nord stated that further clarifications would follow. Why didn't the agency ask for comments before the vote? Why didn't they release the Guidance while they were considering their vote? One man's theory: if they put themselves in position to receive comments, much less ask for comments, it would have been impossible to meet Commissioner Moore's promise to issue guidance before implementation of the Section 103 requirements. That would have forced the issue of a stay, currently stymied with a 1-1 vote by the Commission. It was therefore necessary to make the Guidance "final", or to seem "final", in order to preserve the option that implementation of tracking labels not be delayed. Just a question: where's the fire? I am still hopeful that Chair Tenenbaum will listen to reason and allow more time for tracking labels implementation by voting in favor of the NAM petition. There is much work to do. Ms. Tenenbaum has demonstrated discipline as a regulator in her early days on the job, which I think is commendable. That is not enough, however, given the terrible law she has been given to enforce. While I agree that she should enforce the law as written, she has been given a leadership position that demands more than just being a good administrator. To restore common sense and integrity to the safety rules governing our markets, Ms. Tenenbaum will need to broker a reasonable compromise with Congress as the new Chair. This was a critical point in Bob Adler's keynote speech at ICPHSO in February. Frankly, the alternative is intolerable - without legislative change, much of her good efforts will be wasted pursuing the technical violations of innocent, good companies in lieu of other more impactful safety undertakings. This terrible misallocation of resources should be very troubling to Ms. Tenenbaum, a fate she does not have to accept on behalf of her agency. Recall Effectiveness and The Right Economic Choices. The Guidance notes that Section 103 is meant to help make it easier to identify products subject to recall. The agency also states that it will focus its enforcement efforts on recall situations. In other words, if your product is subject to recall, the CPSC may add to your punishment if you happen to fall afoul of this provision. The Guidance states: "If a manufacturer can identify the location, date of production, and such individualized information as the batch or run number, it can more readily isolate products that it or others may discover present a safety concern. Similarly, if a consumer can identify the manufacturer (or private labeler), location and date the product was made, and any more specific identifying information, he can more easily determine whether a product in the home is the subject of a safety recall." The implicit reasoning of the Guidance (and law) is that consumers need to be in a position to judge whether their product is subject to recall, and this is the "missing link" that would make recalls more effective. As I noted in my tracking labels presentation at the CPSC on May 12, there are many reasons why people don't return recalled products. Primary among the reasons is that they don't hear about the recall. It's a big country, guys - that's going to continue to happen. The second leading cause of not returning recalled products is that they have been discarded, broken or lost/misplaced. One more reason is that people may not want to return it, for whatever reason. The least likely explanation for a failure to return a recalled product is that the consumer knows about the recall, has the product in hand but can't figure out whether it is subject to the recall. What would YOU do in that circumstance? Me, I would return it if I felt uncomfortable. Duh. Frankly, it is amazing that someone sold Congress on the idea that tracking labels would address the issue of recall effectiveness. Unfortunately, the law and its noble goal of better recall effectiveness also ignore all concepts of economics. At the time of the drafting of the CPSIA, Congress was enraged against "evil corporations" for their supposed dastardly deeds and decided to pass a law without monetary wiggle room on any aspect of product safety. The law was drafted with great precision to remove any reference to money or economics (see, e.g., the definition of "technological feasibility" in Section 101(d) in the CPSIA). By writing the law this way, Congress essentially banned economically rational decision-making by children's product companies regardless of their commitment to good product safety. Please remember it is possible to do more than compare the cost of injury against the cost of injury prevention. For many companies, particularly those strongly committed to "doing the right thing" (a not-uncommon kind of company), this is not the calculation they would be making. Consider companies that never or infrequently have a recall. In the case of our company, we have recalled one product once (130 pieces) in 25 years. Clearly for us, recalling products is very rare, so expending time and resources to make these recalls more effective would be economically irrational. Instead, our economic incentive is to channel our limited resources into RECALL PREVENTION. This completely aligns with the interests of our customers and of consumers. Nonetheless, we have no choice under the CPSIA but to invest in the new labels. [In our case, increased recall effectiveness would not be possible since, in our one recall, we spoke to each buyer individually and recovered all the pieces subject to the recall.] Companies like ours would prefer to compare the cost of the labeling program with the risk-adjusted cost of having to recall more product that might otherwise be required. Since we don't expect any recalls (our historical recall rate well under 0.001%), we consider our expected recall cost to be near zero, so any expense to reduce it would be essentially wasted. It's a bad bet for us. Frankly, there are other recall formulas available. For one thing, a manufacturer could recall more units than required. They could also recall everything ever made. If they maintain detailed inventory records using a warehouse management software package, it may be possible to identify the customers who bought the bad goods and recall only through those outlets. It is also possible that specific time periods can be identified to further limit or define the recall. If a product is not identifiable, the maker could also unquestioningly accept it for recall (to remove doubt and build consumer confidence). The CPSC could (and should) allow manufacturers to make these choices and to not penalize them for acting economically rational. To disincentivize rational behavior is to knowingly run an irrational marketplace - which is pretty inexcusable in my opinion. If you very rarely have recalls, these options are probably CHEAPER than putting tracking info on the products. [The most onerous (expensive) obligation under the Guidance is lot markings and the associated quality control and recordkeeping activities associated with lot markings.] It is important to note that there are some kinds of products that pose very little risk of EVER being recalled. Even companies at a high risk of recalls on some products may have a very low risk of recalls on other products. There are reasons for recalls, it's not random, so this kind of thing can often be accurately predicted. A manufacturer dealing with low risk items might also feel it is economically better off by not labeling and simply taking its chances. The law does not permit this, although it is not obvious to me how consumers lose from granting this option. For instance, the highest risk items for toy recall (our industry) are items coated with paint or items age-appropriate for children three years of age or younger (risk of small parts). [The high risk and low risk items in other industries could also be identified.] The risk of recall of other toys is slight or near zero. For us to waste time and resources on an elaborate tracking system for low risk toys is to spend money to improve recalls that we feel strongly will never take place. Yet, we would be risking serious civil or criminal liability if we do not make this investment for all of our items regardless of recall probability. The law now requires us to behave irrationally with only a flimsy justification and in a way that will benefit no one. For some companies, this excessive expense could be quite significant. In our case, the majority of our items (probably the great majority) are highly unlikely to ever be the subject of recalls - so the majority of our soon-to-be considerable investment in tracking labels will be unproductive overhead. Another clear example would be children's book publishers. Even though new books are now deemed exempt from the lead standards, they remain subject to the tracking labels requirement. Why? You tell me. It goes without saying that the waste of resources will not be for companies only. The CPSC will suffer right along with us. And if the CPSC suffers, so will American consumers. The diversion of CPSC resources to purposeless activities dreamt up in a misguided and poorly-vetted law will cost Americans dearly. The new Chairman, Inez Tenenbaum, has rightly stated her intention to enforce the law as written. That being said, this provision is overly broad and wasteful and needs to be revised. It's Congress' job to make these changes. The CPSC Commission, in particular Ms. Tenenbaum, can be part of the solution by making it a priority to explain these problems to Congress and broker a legislative solution . . . soon. July 27, 2009, 12:22 p.m.
At her Senate confirmation hearing last month, new Consumer Product Safety Commission Chairwoman Inez Tenenbaum pledged a “common sense” approach to implementing the Consumer Product Safety Improvement Act, which has caused so much confusion for consumers and so many problems for businesses. The new law, passed by Congress to improve children’s product safety, has resulted in serious unintended consequences for a number of industries due to its overly broad definition of children’s products, unrealistic implementation timelines, and retroactive bans on the sale of existing inventory. The first commission vote on a CPSIA-related issue under the new chairwoman took place this week. Unfortunately, it demonstrated just how difficult it can be to apply “common sense” to the implementation of this law, underscoring the need for Congress to address CPSIA’s problems before more unnecessary damage is done to thousands of small businesses throughout the country. In the 2-1 vote, Chairwoman Tenenbaum and the commission denied a petition for excluding crystal and glass beads in children’s jewelry, apparel and other products from the lead law, despite the fact that both CPSC staff and commissioners acknowledge there is no real risk of harmful lead exposure from these products. While denied the right to apply risk analysis to the issues, Chairwoman Tenenbaum did state that the CPSC won’t enforce this rule outside of the market for children 6 years of age and under. Unfortunately, her statement does not provide meaningful relief, as the commission’s decision means the crystal and beads violate the law for all children 12 years of age and under, and thus to knowingly import or sell these items is to risk violating the law, something that manufacturers and retailers simply will not risk. Soon the commission will face another lead-law decision, this time involving a petition to exclude raw, natural or man-made material that is made into finished articles of clothing from the lead laws. This decision should be even more straightforward, as the apparel industry has shown through extensive testing data, expert testimony and overwhelming evidence presented to the CPSC that textiles are inherently lead-free. Yet even though those plain T-shirts and socks in your kids’ drawers don’t have lead in them, the current law compels companies like mine to prove again and again that that is the case. If common sense is followed, we are optimistic that when Chairwoman Tenenbaum and her colleagues consider our request (hopefully soon), the overwhelming evidence we presented to the CPSC seven months ago demonstrating that these materials are inherently lead-free will result in textiles being exempted from this law. Unfortunately, as Chairwoman Tenenbaum is discovering, Congress created a law that explicitly blocks the government’s own product safety watchdog from practicing common sense risk management in policing product safety. Businesses need to know what rules and regulations they must follow, especially in an industry like ours that requires long lead times from design of a product to the moment it reaches store shelves. Yet until we have a clearly articulated exemption, companies — particularly small businesses and home crafters who lack the resources to change product plans on a dime — must continue to grapple with the lack of predictability they need to run a business. What is lost in the debate is that our industries share in the goal of improving product safety and support strong, enforceable safety standards — our entire industry depends on consumers having faith in our products. But arbitrarily denying consumers access to safe products is not the same thing as improving product safety. It’s time for Congress to hold hearings and fix the problems with this flawed law. Steve Levy is director of operations at Star Ride Kids, a manufacturer of children’s clothing, and president of the Coalition for Safe & Affordable Childrenswear, Inc. The transcript of the Hugh Hewitt interview is at this link. Here's a link to the Hugh Hewitt interview. The interview starts at 10:37 and goes about 20 minutes. If you can't open it, try this one. ShopFloor.org had this to say about the interview. Let's hope we had some listeners - in Congress. . . . I will be on the Hugh Hewitt Show today to talk about tracking labels under the CPSIA (see his blogpost). I am scheduled to be on at 5:20 PM CST for about 20-25 minutes. You should be able to pick it up on the Internet live at KSKY. If this link doesn’t work for some reason, these three stations carry the show live at that time: www.ksky.com www.wntp.com or www.krla870.com. They all have “Listen Live” buttons on their websites. The show will also run on tape delay at WIND 560 AM in Chicago (8:20 PM CST). Alternatively, you can get it by clicking on www.560wind.townhall.com or listening at 560 AM in Chicago. To let my children’s products go! And demanded he fix this CPSIA mess! I will admit to changing one word . . . . Let's hope someone's listening. I am not looking forward to a world without rhinestones. 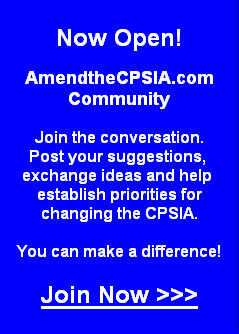 CPSIA - Is Congress United Against Amending the CPSIA? The CPSIA was passed in August 2008 by an overwhelming majority in both the House (424-1) and the Senate (89-3). Supporters and zealots behind the law, after clucking over the perfect legislative process used to create the CPSIA, assert that the vote totals express the Will of the Nation behind this "wonderful" law. That kind of reasoning seems full of holes (such as, for example, the timing of the 2008 election cycle), but for awhile, many people fell for it. I have attached an update on where Members of Congress stand on the CPSIA today. It's not quite so lopsided anymore. There are now 43 Senators and 96 Representatives who have either sponsored or voted for CPSIA amendment legislation. Perhaps someone is listening! This group of concerned legislators includes Democrats as well as Republicans. Let's recap - there were FOUR Members of Congress who voted against the CPSIA, and NOW there are 139 Members of Congress who have taken positive and public action to amend it. Hmmm, what was that about the Will of the Nation? Amending the CPSIA has yet to leave the starting gate, courtesy of Senate and House Democratic leadership who for their own mysterious reasons refuse to acknowledge that this law has ANY flaws whatsoever. It's very sad that certain people have hijacked children's product safety and turned it into some sort of political plaything. We will continue to work to make it clear to the American public where the legislative breakdown is. For the moment, however, I wanted you to know that there is considerable support for changing this law. It's not just us wacky "bloggers" who want this law changed. Members of Congress do, too. Now let's just do it! To thoroughly and thoughtfully reply to this week's deluge of CPSC publications on tracking labels will take a little bit of time. [I also have a day job.] As the agency took more than 11 months to issue their documents, I will need a few days to digest and parse it for you. The Time to React to Tracking Labels Guidance is absurdly Short. As noted, it took the CPSC more than 11 months to answer even ONE question on tracking labels. Notwithstanding the Commission's obvious efforts to be appear to be flexible and cooperative in the new guidance, it remains a fact that there are now only 22 days until August 14. The diversity of companies and industries affected by tracking labels is simply mindboggling. Commercial lead-times on production runs are (shall we say) OBVIOUSLY more than 22 days. How is that runaway train supposed to stop on a dime in supply chains all over the world? Notwithstanding the CPSC's flexibility pledge in their guidance, what does the Commission think companies will be able to do in the short period of time before August 14? I previously alluded to the fact that some people actually take summer breaks, so they might not even be scheduled to be at work to get this critical task started. For quite some time into the future, particularly in long lead-time industries, many companies will be stuck with whatever they decided to do many months ago. The new guidance will be ineffective to prevent breaches of law as of August 14. In that sense, the guidance is a total failure. Even the chore of carefully checking the guidance against your current practices will take a great deal of time. We have 2,000 items in our line. They're not all the same and will require one-by-one examinations against the guidance. We have already compiled a lot of data about our products in anticipation of this ruling. Now we must repeat the exercise since we FINALLY got some answers. Oh well, just another waste of our time and money . . . . Likewise, I have mentioned in this space a company concerned about tracking labels with 60,000 items in their line. What are they supposed to do, just take a chance? Close their doors until they get this right? They certainly couldn't complete even a PLAN for these items within the next 22 days. [Consider the chore of even picking samples of 60,000 items and laying out for examination - what would you need, a football stadium?] The coercive power of the CPSIA which makes every violation subject to large penalties (or worse) is weighing heavily on everyone's mind. What are we supposed to DO? Notably, the corporate camp affected by the CPSIA seems to be divided into a couple groups - the "guessers" and the "waiters". The guessers decided to implement tracking labels according to their best bets (months ago) on what the law meant. Many of those guesses will be wrong, and some of those guesses will hurt the guessers. An example: if a guesser decided to print the name of its source on its product (not required by the new guidance), then its competitors and customers will know their secrets. This would hardly count as a "guess" - we were told to do it in a Q&A session at ICPHSO by CPSC staff. While the CPSC promises to not penalize people for good faith attempts to comply, they likewise have no plan to compensate them for the cost and consequences of the guesses they were forced to make. Too bad for them, I guess. On the other hand, the waiters have been waiting for answers to their reasonable questions. Many "waiters" are waiting simply because they cannot afford to do things twice, principally because of limited resources (money usually, but also time, space and labor limitations). It is not irrational, unprecedented or un-American to wait for clarification before attending to comply with a vague and imprecise law or regulation. Unfortunately, a hallmark of the CPSIA is its callous disregard of the limited capital and resources of small and medium-sized businesses - the waiters were put in a position to either guess at their own risk or be made to look like bad corporate citizens for waiting for answers that came at the 11th hour. The waiters didn't want to waste more money on "guessing" - they couldn't afford it, especially in these difficult economic times. Perhaps they felt they had a right for solid rules and solid answers before acting. Is that wrong? Or, is the CPSIA leading the way toward a new style of law where guessing is required, standard? I would note further that nowhere can this author find reference in any of the Commissioners' statements, in the CPSC's FAQs or in the CPSC's new tracking labels guidance indicating that tracking labels are needed urgently to address some kind of emergency. It is not. Notably, the power to impose tracking labels has been in the CPSC's arsenal for more than 30 years. It's nothing new. Congress got a bee in its bonnet over this issue last summer and usurped the Commission's discretion by imposing the new requirement, that's all. The Commission has implemented tracking labels in the past in isolated situations where it deemed them necessary to address a public health issue. It has also DECLINED in the past to impose them in a sweeping, across-the-board manner without regards to facts or circumstances. Even the positioning of the provision in the CPSIA by all concerned is that it is a "nice to have" to improve recall effectiveness. I have previously pointed out that the strict new regime of law on safety will also sharply reduce the number of recalls - in other words, the urgency of this "nice to have" diminishes on a daily basis. So . . . if the tracking labels are no emergency, why isn't the CPSC taking the high road in this new Tenenbaum era to give industry time to digest the rules, dialogue with the agency on its further open questions or reasonable objections, and implement tracking labels in a planned and orderly fashion? Good question, perhaps? Ms. Tenenbaum has the opportunity to make this a reality by voting in favor of the NAM stay petition before the August 14 deadline. Every day that goes by without the stay, the problems for the victimized industries will grow and grow. Ms. Tenenbaum, please don't leave us hanging. Do the right thing - vote for the NAM stay petition. Thank you. CPSIA - Where is Everyone (on Jewelry)? Perhaps it has occurred to you that it is a little odd that I am writing about jewels. I don't wear jewelry personally and we don't make or sell jewelry in our business. So where are all the people who are principally concerned with selling these now-illegal stones? Good question - they are hiding. The decision to confirm the illegality of the stones essentially shuts off debate because you essentially invite the regulators into your (business) home by expressing interest in the topic. Thus the silence . . . . This is nothing new. I was the only businessperson to speak out on lead at the November 6 CPSC Lead Panel and likewise was the only operating company to address the CPSC at the May 12 Tracking Labels panel. In fact, three other companies scheduled to speak were "no shows". They didn't even enter the building. When we had our April 1 Rally in Washington, one of our speakers dropped out when we asked him to disclose information he wanted to keep very close to the vest, namely . . . his last name and his company's name. When he heard we needed to know this (to introduce him), he disappeared, never to be heard from again. Why are people so afraid? Well, several companies that turned themselves in for lead-in-paint violations were recently hit with penalties. There's a strong message in that for everyone - your good faith cooperation will be punished the same as bad behavior. The regulators' apparent logic is simple - to violate the law is "bad" and must be strongly discouraged (this is what Congress "wants" . . .), thus there is little difference between turning yourself in and getting caught, each is "bad" and needs punishment. If you are sitting on product that is suddenly illegal (contraband), do you want the regulators (or worse yet, your customers) to know it? This question needs no answer. Normally, when there is a "debate" and one side doesn't show up, it is assumed that they are disinterested, have nothing to say, are conceding the debate for some reason or some such. There's always a story to explain the silence. The story here is simple - speak up at your own risk. And no one is willing, big surprise. The CPSC seems to think it is fostering a debate. But with a law on the books that makes everything illegal, debate is impossible. In addition, since the law is based on strict liability (the standards are absolute and have no flexibility to address minimal risks or needless economic damage), the most pertinent arguments are off the table. Ms. Tenenbaum herself correctly points out that safety considerations are not relevant in the Section 101(b) test for exemptions. What can you say to defend the decorative stones other than that the economic damage to your company and industry will be severe? Is it worth taking the risk of exposing yourself to make such a losing argument? No way. The non-debates give the misleading impression that support for the law and its "common sense" implementation is widespread and unopposed except for a few cranks like me. I beg to differ. Our freedom of speech is wasted when our laws punish free debate by free people. Someone, somewhere, should be really upset about this degradation in the conduct of our society. I understand that the CPSC Commission believed it was effectively giving relief to the fashion jewelry industry by limiting its enforcement activities on crystals, glass beads and rhinestones to products for children aged six years or younger. I would like to clarify my previous comment on the effectiveness of this "relief". While the Commission's intentions were commendable, their decision provides no relief at all. Why? First and most signficantly, the Commission has now removed all doubt - ALL subject stones (glass beads, crystals, rhinestones) are violative if they exceed the lead standards and if included in a product intended primarily for or designed for children twelve years of age or younger. In other words, these products are ILLEGAL. To sell them is to "knowingly" violate this law (CPSA Section 20(d)(2) - "the presumed having of knowledge deemed to be possessed by a reasonable man who acts in the circumstances, including knowledge obtainable upon the exercise of due care to ascertain the truth of representations"). That means penalties, even if you turn yourself in under Section 15(b). To sell such materials INTENTIONALLY (as might be induced by CPSC's highly-publicized policy to not enforce on products for children seven years of age or older) would be grounds for a felony charge. That would be perceived as a problem by most people. . . . Most business owners and operators would take aggressive action to extinguish the possibility of any felony charge. Think of the shame that comes with this territory - felonies are serious crimes and might involve jail time and asset forfeiture (as though you were a drug kingpin). Felonies are easily avoided if you are good, law-abiding person. Have you ever committed a felony by mistake? No, I imagine not. Have you ever gotten close to the fuzzy line defining a felony? Again, probably not - most felonies are sharply defined. It's fairly easy to tell if you have murdered someone, for instance, and easy to avoid if you haven't already done the deed. How will businesses deal with this problem? They will stop selling rhinestones, etc., perhaps altogether, to avoid this risk of civil or criminal liability. My experience with retailers, particularly publicly-held retailers (notably subject to the invasive and highly-risky Sarbanes-Oxley disclosure), is that they do not like take to take financial risks. Risk is decided against suppliers. If you have any doubt about this, consider TRU's new requirement that suppliers meet a 100 ppm lead-in-substrate standard as of January 1, 2010, almost two years ahead of any determination by the CPSC that it is required. TRU has taken the most conservative, risk-averse approach to "safety" since the lead-in-paint recalls of 2007-8. Their financial industry owners made a highly leveraged bet on TRU and don't want to blow it with uncontrollable liability risks. They would rather lose suppliers than take risk. Retailers dealing with the jewelry decision will simply insist on safety tests for all jewelry and apparel/shoes containing the stones, and the CPSC-certified labs will fail them all. It's a lock that these items will disappear from store shelves, notwithstanding the CPSC's promise to not enforce. Another terrible implication of this decision is that possession of the now-illegal stones will mean significant and immediate inventory losses. Determining which stones are for which age child will be challenging or impossible. Products containing the stones are therefore likely considered contraband now, worthless in their present form. Who wants to be stuck with that loss? This is the classic "hot potato" problem highlighted in last November's Journal of Commerce article. Whoever has this inventory gets whacked with a total loss so a war will break out over its rightful owner. This is also the painful interaction of the Commission's decision with the Proposition 65 settlement and other correlated state laws - somebody's going to eat a lot of inventory (starting yesterday). To avoid this kind of risk, retailers will dump the goods back on makers, and the makers will have few options for the goods returned under this cloud (remember, felonies?). Let's also not forget that products that are illegal under the CPSIA are not eligible for export to ANYWHERE. In other words, illegal here . . . illegal EVERYWHERE. The losses are total and irrevocable, courtesy of this decision. Who would want to get in the middle of that? The fashion jewelry decision came as a shock to starry-eyed (non-cynical) optimists who held onto inventory from February without writing it off in the hope that the Commission would somehow preserve the stones' value. No such luck for them. With the Commission's decision, massive write-offs are now certain. In my original letter to Cheryl Falvey on retroactivity (here and here), I explained that inventory turning overnight into contraband would lead to widespread loan defaults, among other evils. It is not hard to imagine that among CIT's problem loans today are a few contraband jewelry and apparel/footwear cases arising from or related to this decision. To add to the fun, the CPSC's new best friend, their partner U.S. Customs Service, is said to be impounding these goods as they are imported. I understand that numerous shipments are being delayed over these stones. What's the defense of the importer? "Hey, I know it's illegal but the CPSC says they don't care. . . well, they CARE but they won't enforce . . . right, no enforcement but still illegal, yes, can I have my inventory? . . . I can't give you a test report, the stones are over the limit but the CPSC says they won't be looking . . . but you ARE looking? . . . should I put my lawyer on the phone to explain???" Yeah, that might work . . . on Mars. It's a royal mess but frankly, the CPSC and the Commission did as much as the words of the law allows. The law is very poorly-written and was even more poorly-vetted, and must be changed. The Commission will have more trying days ahead as it tries to make sense of a law that makes no sense. It's self-destructive legislation causing widespread harm but Congress stands passively on the sidelines, ready to point fingers. I think we as a country can achieve more. Now somebody has to prove it. CPSIA - Tracking Labels Guidance, Here it is . . . . Here's the long-awaited tracking labels guidance. The CPSC Commission just released its statements on tracking label guidance. The guidance and FAQs will be published shortly. Further to yesterday's post, I thought you might like to read the Fashion Jewelry industry's arguments in favor of relief by the CPSC Commission for glass beads and crystals. The July 15 letter is painful to read. It didn't sell with the Commission. The losses from this decision will be massive and pointless. Perhaps it is easy to slough off this decision as a curiosity. You might feel differently if you ran a company where the livelihood of your employees depended on these items. This weighs heavily with business managers - those folks are your family. It's all the more painful knowing, as everyone knows, that these materials pose no safety risk from lead. Thus, the jobs and large amounts of scarce capital sacrificed to implement this rule will achieve nothing for anyone. No one will be safer, life will not be better, society will not be fairer, people will not be happier. Let's not forget that jewels and jewelry have been coveted human possessions for millenia. The desirability and demand for these items is undeniable. They bring pleasure, they help create goodwill, self-esteem and quality of life. In this particular case, the glass beads and crystals are properly described in the industry's letter as "bling". Rhinestones, glass beads and crystals are not expensive jewels, of course. For children, these stones allow them to actively join in the societal passion for jewelry. It also allows parents to affordably provide jewelry to small children which has significant self-esteem benefits for parents and kids alike. From an educational standpoint, inexpensive jewelry is an excellent pretend play item, which fosters the development of creativity and imagination. All these benefits will be lost when the stones are withdrawn from the market. There are no good substitutes for these items, only lesser placeholders. As I explained in my earlier post, the liability risk inherent in the Commission's determination that these materials are not exempt from the CPSIA will inevitably drive these materials out of the market. There is precedent for this (resale shops' sharply reduced sales of children's items). With the extremely tight and unproductive penalty clauses in the CPSIA, only a crazy person would take the risk of knowingly and intentionally selling violative products, whether or not the CPSC says it won't enforce in some vague fraction of the market. In addition, retailers are quite unlikely to sell items that aren't supported with passing test certificates in the coming months. It will be impossible to get a passing test report for these materials now. So kiss off the availability of inexpensive jewels for children. This is so senseless. Congress should be ashamed. I, for one, do not look forward to a bling-less world, nor do I take comfort in the bland and unbelievable assurances from do-gooders that the lead restrictions will be "good for children". The safety of these materials is beyond question - the risks asserted by consumer advocates are absolutely imaginary, designed simply to prop up their life's work, the noxious CPSIA. The Emperor has no clothes, why won't Congress admit it? From Twitter (Scott Wolfson): @toyalliance 3-0 vote tonight, track label guidance document and Commissioners' statements will be online tomorrow. With morbid anticipation, I just read the statements of the three CPSC Commissioners on the Fashion Jewelry industry petition to exclude crystals and glass beads from the overbearing strictures of the CPSIA. On a day when I was a bit emotionally damaged by Tom Watson's failure to win the British Open, these statements more or less finished me off. Should we laugh or cry over this decision? Cry, because it bodes terribly for all of us. The jewelry industry made all the usual arguments for excluding these non-controversial items from the law. The items in question have no history of causing injury, they are infrequently abused, the amount of lead possibly ingested is absurdly low, etc. Been there, done that. The staff recommended against the petition, per form, because the law clearly states that nothing can be exempt unless it either is always within the law's lead limits (in other words, it already complies) or else it cannot emit so much as an atom of lead into the body. The CPSC staff has previously opined that it has yet to identify a single Earthly material which meets this "common sense" standard which is why it has recommended denial of each and every stay. The two Democrat Commissioners voted to deny the request on the grounds that the law does not permit exceptions. They then said they would direct the enforcement activities of the agency toward the class of children they deemed most "at risk" (a relative term, if there ever was one). Republican Nord also voted against the exclusion as required by law, but recommended a stay, mainly to allow Congress to fix the law. a. The Days of Easy Stays are Over. The ATV'rs and bike industry can take some (limited) pleasure in their short stays. The window seems closed. Of course, it also means that when their stays are up, they are likely in big trouble. Chairman Tenenbaum took a strict constructionist view of the law: "[Having concluded that swallowing crystals and beads is foreseeable as required under Section 101(b)(1)(A),] the question turns to whether the ingestion or mouthing of these beads would result in the absorption of any lead by a child. In making a determination, I was mindful that the statute does not use the term "harmful" amount or another term which would allow staff to utilize a risk based approach." [She later explicitly rejects a risk based approach as not permitted under the CPSIA.] In other words, true to her word at her confirmation hearing, Ms. Tenenbaum is committed to enforcing the laws handed down by Congress without judgment. She read the law faithfully and did what it instructed. There was no consideration of consequences of the decision or of the relative risk posed by these materials. Commissioner Moore chimed in with his own analysis of Congress' instructions on the narrow question of crystals. In quoting from the House Report behind HR 4040 (CPSIA), Moore noted that "Paragraph (4) authorizes the CPSC, in very narrow circumstances, to exclude, by rule, certain materials and products from the total lead weight limits. The lead content of these materials must be in a form that will not result in absorption of any lead whatsoever into the human body. . . ." [Emphasis added.] There you go. Mr. Moore also notes that this decision of the Commission effectively overrules a Proposition 65 settlement applying to crystals. Not sure how the Commission's decision could be made more disruptive or commercially devastating. Even the over-the-top Proposition 65 is outdone by the CPSIA. The reliance of jewelry companies on this California settlement was seemingly not taken into account by Commissioners Moore or Tenenbaum. I believe the effect of this decision is to render the industry's inventory prepared in compliance with various states laws like California and Minnesota instantly WORTHLESS. To continue to sell these items on Monday is an intentional violation and we all know what misery that might bring. More gratuitous business risk and economic losses from your friends in Congress. . . . I believe the Commission's stay decision on pens needs to be read very, very narrowly in light of the jewelry decision. It is hard for me to believe that the logic of the pens decision will be utilized again. Until it is, I believe that decision should be regarded as limited to the specific facts and circumstances of pens. b. Economics Will Not Be Considered in Exclusion Decisions. Commissioner Nord produced a laundry list of immediate economic harm from the decision to reject a stay. It is shocking. Presumably, this data was available to the entire Commission but notably neither Tenenbaum nor Moore mentioned it. This makes sense because the CPSIA does not make financial impact relevant in these decisions. The Commission's decision is driven by the law's definition of the interest of consumers (note, I do NOT mean the ACTUAL interest of consumers), namely that "any lead is too much lead" and thus, financial impact is outside the decision matrix. I do not think this is right, because the law is really just a bundle of economic incentives, and in making this decision, the Commission is changing the rules of the market which will change behavior. Products will be killed, choice reduced and companies will exit. The widespread elimination of children's departments in the resale industry is a pertinent example of this effect. By narrowly defining consumer interests in this way, the CPSC ensures maximum economic damage to everyone. Here's a glimpse of the future: In two years, the Commission will make a decision on whether the new 100 ppm lead limit is technologically feasible. This term is defined in the CPSIA in Section 101(d) - and nowhere will you find a reference to economics. Thus, my new pet saying can be taken as LAW now: If Rolex CAN do it, Timex MUST do it. Put that in your pipe and smoke it. c. The Commission Seems to Think that Enforcement Discretion Makes Violations Go Away. The statements make clear that the CPSC won't be enforcing this rule outside of the market for children six years of age and under. What they do not address is the fact that they have clearly stated that these materials violate the law for all children 12 years of age and under. Thus, to "knowingly" import or sell these items into their no-enforcement zone is to take the chance that a shift in regulatory wind could mean BIGGGG trouble. The CPSC is unable to restrict the 50 State AGs either, so it leaves everyone WIDE OPEN to nastiness on the State level. Sound good? Who would take this chance? The gerry rigging of this law in this way does not replicate the law that preceded the CPSIA (if that was the goal). In other words, this construct simply does NOT work to lessen risk or financial harm. By saying that the CPSC will only enforce in certain circumstances does NOTHING to make it easier to do business. We are not allowed to violate the law, whether the CPSC wants to enforce it or not. Read the penalties section and think about how penalties have been handed out so far (with lots of imputed "knowing" conduct). In the olde days, the decision on where to enforce or not was completely effective to demarcate the part of the market that needed to tighten its legal belt because back then, everything wasn't illegal. Now it is. The policy to only enforce in part of the market doesn't relieve any responsibility under the law - it only gives the appearance of shifting risk to that part of the market. Remember your 15(b) obligation to report - it still applies to ANY violation. Remember your whistleblower risk - you can't discuss using violative materials in the no-enforcement zone or risk "problems". Remember that any intentional violation of the law, whether the CPSC intends to enforce or not, could be grounds for a felony charge. Hey, it's not my idea - read the law. Do you want to run your business feloniously, even if the Commission says it's okay (today)? d. Forget "Common Sense". The Commissioners in avoiding the obvious conclusion that glass beads and crystals can be safely sold and sticking closely to the ridiculous language on exemptions (notwithstanding the encouragement of the CPSC by a "primary sponsor" of the CPSIA to grant exclusions for "materials that can be shown to pose no [risk of a] measurable increase in a child's blood lead level", as noted by Ms. Nord) clearly breaks with the tentative baby steps of the Commission under Nord and Moore to introduce a semblance of common sense into the implementation of the CPSIA. Those days seem to be over. The new attitude appears to be that the law as written is to be enforced and that blunting the edges with "common sense" is inappropriate. The Tenenbaum Commission's approach to statutory construction makes a lot of sense to me. I have long asked the Commission to enforce the written law and not make it up as they go along. Unwritten laws are even worse than bad written laws. I am glad the Commission is showing it can read. Congress remains in denial. I don't know if the jewelry decision is more of a message for Mr. Waxman or for you and me. If we or anyone wants a different way to administer safety, it will require a change in federal law. This is the reality of our situation, like it or not. This Commission apparently intends to enforce the law as written, and that won't change even if the law is foolish on its face. "Common sense" is no longer part of the calculus in interpreting this law strictly. e. Don't Hold Your Breath for Relief on Tracking Labels. The narrow reading of the law by the Commission here, where almost nothing (other than money) was at stake, suggests grim tidings in the super-secret tracking labels guidance due to be voted into effectiveness without your comments on July 20. I can only speculate on why the Commission didn't think we should read the guidance before they voted on it. I think we could have handled it. The jewelry decision suggests that it is highly likely that the many problems created by the tracking labels provision will be left in place. As previously noted, the CPSC has not deigned to respond to ANY questions on the noxious tracking labels provision in the last 11-and-a-half months. We have no idea where they stand on anything. Let me give you a great example - I think the guidance is going to require you to disclose your sources on your packaging and on your product directly. This was forecast by Gib Mullan and Cheryl Falvey at ICPHSO in February (we were told to "get over the mourning process"). This term alone will kill many companies and many products. All high volume customers will now have the option to go direct, courtesy of Congress. While this may seem like a zero sum game at first glance, what it really means is that the incentive to innovate or take financial risk on any item that you cannot protect will end. Private labeling will become much harder or impossible. Trading among competitors will end. The net result will be shrunken markets and withered companies. Serious consequences will follow. Again, the Commission has more or less indicated that economic consequences are not its concern, as Congress in its infinite wisdom has determined this provision is best for all of us. Brace for it. I have long stated that tracking labels is the absolute worst part of this law. The emergency posed by this law is drawing near. If tracking labels becomes law on August 14 without delay and if this law isn't revised significantly in the very near future, the outlook appears very, very grim for all of us. The posture of this Commission suggests that we might be facing a worst case scenario soon. This is disappointing, to say the least. It is Congress' fault. The CPSC is doing what has been asked of it, ridiculous or not. If you are still sitting on your hands, you might want to call your lawyer soon. John Stossel and The Washington Times published biting indictments of the ridiculous CPSIA today. The title of the WT article says it all: "Lead in the Head". You betcha. Hey, did anyone notice the tracking labels guidance today? I didn't. So we wasted yet another day while secret deliberations were conducted by the CPSC Commission about the future of our businesses. Welcome to outcast status. As noted, the vote on the super-secret guidance is set for Monday, July 20th, leaving a pathetically meager 24 days for integration of this dramatic requirement into our businesses before tracking labels become law. Hope you weren't planning a summer vacation this year! Who on Earth would go away for two weeks in the middle of this artificial crisis with such urgent work to do? As I have mentioned, a failure to follow these rules TO THE LETTER would constitute a knowing, intentional violation of the CPSIA - uh-oh, a felony and that means possibly rooming with Mr. Madoff! The tracking labels guidance will create winners and losers, and is guaranteed to create instantaneous chaos in the marketplace. A vacation would be utterly irresponsible in the middle of all this, wouldn't it? I imagine the CPSC and the Commissioners in particular must really feel our pain - the summer only comes along once a year, the kids are out of school and it's the annual great opportunity to be together as a family - but because of the late arrival of tracking labels guidance and the failure of the Commission to grant a stay, I guess we are all supposed to stop living to avoid going to the pokey. Something's not right with this picture. It feels somehow . . . open, transparent and collaborative. CPSIA - Consumer Groups Feel Snubbed, Boo-hoo! The nomination of Harvard Law scholar Cass Sunstein to head OMB's Office of Information and Regulatory Affair looks to be moving toward confirmation after he met with farm lobbyists and a senator upset with his views on animal rights, but consumer and environmental groups are peeved they could not get such meetings. Senate Agriculture ranking member Saxby Chambliss said Wednesday he was lifting a hold he put on Sunstein due to his writings urging stronger rights for animals and suggesting animals be allowed to become plaintiffs in lawsuits. Chambliss said he felt Sunstein had listened to both his concerns and those of farm groups. But after CongressDaily reported those meetings, representatives of several consumer groups faulted Sunstein for refusing to meet with them over their concerns about his views on the use of cost-benefit analysis in regulation. OIRA reviews regulations proposed by other federal agencies. Those groups included Public Citizen, the National Resources Defense Council, the Environmental Defense Fund and Center for Progressive Reform. "It certainly sends a curious signal that he is allowed to meet with agribusiness [representatives] and big business, but not consumer advocates," said one spokesman. "Surely the administration doesn't just not care what consumer advocates want." Representatives of several of the groups said they had a meeting scheduled with Sunstein last winter but showed up to find Sally Katzen, who held the same job under President Clinton and is now at the Podesta Group, in Sunstein's place. Katzen said Sunstein had been "muzzled" during the confirmation process, sources at the meeting said. "Like all nominees Cass was not meeting with any outside groups to discuss policy positions of the administration," an administration official said. The impact of the CPSIA on books and on libraries has been a magnet for attention. Recently, the New Atlantis published an article by Elizabeth Mullaney Nicol entitled "Keeping Books Safe - A Bad Law Threatens Our Past". It's worth a read. Among other things, Ms. Nicol notes the incentive to create black markets for goods that consumers want but which are outlawed by the CPSIA. What a nice innovation, Congress creating incentives for our economy to mimic the Soviet Union's efficient (and now defunct) system of goods distribution! Comrades, it's a Brave New World. . . .
Ms. Nicol also insightfully comments about why the books issue is so important: "The CPSC has provided an exception for books sold as collectors’ items, not intended for children to be reading. But the availability of these books to children is the very purpose and value of preserving them. We want them in children’s hands, being read, not only preserved on the dusty back shelves of research libraries." And then there's the small issue of the First Amendment. Check out her article, and break out the hankies. This is your government at work. a. The Tenenbaum hearings scheduled tentatively for next week in front of the House Energy and Commerce Committee have been postponed indefinitely, supposedly until sometime in September. I do not recommend holding your breath waiting for Mr. Waxman to act. Expect Senate hearings first. Mr. Waxman wants us all to rot before he allows anyone to discuss the CPSIA publicly in front of him. A consistent man, this is one in a series of hearing cancellations on the CPSIA for him. He has not held a hearing on the CPSIA since it was passed last year. I guess he must feel there's nothing to discuss. We seem to be talking to ourselves here. b. The tracking labels guidance is DONE - yippee, how exciting! Of course, we are not permitted to read it . . . . As disclosed in this space yesterday, the guidance is up for a Commission vote before you get to read it. Apparently, they know what's best for all concerned, so seemingly there is no need to solicit your comments on this long-awaited document (it took more than 11 months to craft). [N.b., as previously noted, despite great effort in constructing the first set of rules on advertising rules last Fall, the CPSC felt a need to solicit comments on the new rules and later significantly changed them. There were many comments submitted, and serious issues were fleshed out in these comments. In other words, the later round of public comments on the rules had some VALUE. Public comments on new rules has much precedence at the CPSC over the last 30 years. Those days are gone, apparently.] No vote on the NAM tracking labels stay petition has been docketed. We are now 30 days away from implementation of the tracking labels requirement. Zero questions have been publicly answered on tracking labels thusfar. IMHO, many important and reasonable questions have been asked on this topic by many different affected industries. The point has been well- and clearly-made that it takes TIME to implement something as sweeping (and pointless and ultra-expensive) as tracking labels. Any person of even modest sophistication can figure out that three weeks advance notice ain't gonna do it. The Commission vote is docketed for July 20. That leaves 24 whole days to absorb and implement tracking labels according to their new FINAL rules. Golly, that doesn't sound like much time (especially for the inevitable curveballs or impossible requirements), but if you consider that 24 days are comprised of 2,073,600 seconds, it sounds like a lot more time. Insiders admit the guidance, when we get to read it, won't answer all the questions. Hope those aren't your questions, that would be a shame. The cold detachment of the CPSC's guidance approval procedure, REGARDLESS of the wonders of the new guidance, leaves me speechless. Well, that's a lie, I am never speechless. Consider the betrayal in this initial handiwork of the Tenenbaum Commission. Here is a quote from her job application (her written testimony before the Senate Committee on Commerce, Science and Transportation on June 16): "I will ensure that the Commission is operated in an open, transparent, and collaborative way and in a manner worthy of the American people. . . . While emphasizing the life-saving mission of the Commission, I will also ensure that industry knows that their views will be heard and considered." Aha, so this is the new model of an "open, transparent and collaborative" process? Is this new procedure the way Ms. Tenenbaum plans to convince industry that "their views will be heard and considered"? Ms. Tenenbaum, we heard you in front of the Senate Committee - how can you justify this kind of leadership as Chairman of the CPSC? It bears repeating that the tracking labels provision does NOT fix or even address a public health disaster - it is a made-up "crisis". There is no possible risk to life or limb from delaying the implementation of this provision - so why the apparent refusal of the Commission to do the right thing and admit that the CPSC has failed to give timely guidance? Needless to say, this is not OUR fault. With the recent invention of "enforcement discretion", the CPSC has a demonstrated ability to rewrite safety legislation. [It's unconstitutional, but who cares nowadays?] The CPSC has also been told by leaders in both Houses of Congress in no uncertain terms to use "common sense" in implementing the CPSIA, a tacit invitation to make all the problems go away. I do not see how the right response to these Congressional entreaties is to close the door on dialogue and shove this provision down the throats of struggling domestic industries. Why not push it off for a reasonable period of time and reinforce Ms. Tenenbaum's promise to be open to the ideas of industry? The CPSC can do better. It knows how to protect the public without putting an end to commerce in this country. I hope they will exercise better and more caring judgment in the (near) future. There won't be any products to supervise if they manage to kill off all the companies. CPSIA - Tracking Labels Guidance, Where is it? Last Friday, Nancy Nord said (in a Tweet) that tracking labels guidance was coming: "nancynord update:#CPSIA We're trying to reach agreement on tracking label guidance; hope to issue soon. Watch for it, then take a look and speak up." This guidance has yet to be issued. Today is a momentus day - we now have only ONE MONTH to go before the tracking labels requirement becomes effective. Have you seen any guidance yet? I have not. It's fascinating how the CPSC has handled the tracking labels issue. In this case, it's all the CPSC - Congress made the mess but the CPSC is clearly in charge of implementation and guidance. The CPSIA provides that tracking labels became law (prospectively, thank heavens) without further action by Congress or the CSPC on August 14th of this year. Gib Mullan made this quite clear at ICPHSO in February. The agency received well over 100 letters in April and had a tracking labels hearing on May 12 (see my testimony here and here). Since then, putting aside rejection of the NAM stay petition on May 14), zippo. Now with less than a month to go, the guidance is STILL forthcoming. Rumorville has it that it will be "final" as issued, no public comments will be solicited and it will receive the backing of the Commission (after which we will be entitled to read it). It is not clear what the guidance will be, but no doubt it will be constrained by the wording of the statute which limits the flexibility of the agency. Thus, your heart should not fly at the possibility of sudden and unexpected salvation. If it happens, great, but why expect it given everything else that has transpired? Among the aggravations of this water torture process is that we in industry have asked reasonable questions about this provision, lots of them, and have received NO reply. We raised serious concerns and explained clearly that there are economic incentives here that are dangerous and will have real bite in our businesses and market. Silence. So what happened to dialogue? Yes, the CPSC asked for and received comment letters and yes, they had an open forum for businesses to speak out (one did, ours, plus some trade associations) - but what about give-and-take and discussion? Given the seriousness of this issue, why hasn't there been further conversations, brainstorming, exchanging of proposed rules and further comment periods? This was not such a bizarre idea a few months ago when we went through a similar cataclysm over advertising rules. Not only were letters exchanged but there were also off-line discussions, submissions and most importantly, dialogue AFTER the rules were proposed. The CPSC, as you may recall, changed its rules after they were issued in response to industry submissions (including mocked-up catalog pages). Indeed, a few months ago, the agency actually was still trying to listen. The well of dialogue has been lately poisoned by reactivity and evil politics since then, making it seemingly impossible to reach the CPSC on these issues. And does the CPSC have any idea of how the delay is harming businesses? What do they think we are doing right now? We are guessing about tracking label requirements for production runs scheduled in less than a month and trying to deal with panicky retailers who won't take any "risk" on this issue. [For instance, we have one customer who reserves the "right" to return goods without further authorization NOW for lack of tracking labels.] Everyone is trying to figure out how to survive August 14. This is no small undertaking for many businesses. Today I spoke to a friend who has 60,000 skus at his companies. Hmmm, a few all-nighters ahead for him, I guess. This is no joke. I do not understand how the CPSC can be so heartless and insensitive on this issue. We should have not to beg for a sensible delay on this provision - yet the Commission is currently split 1-1 on the NAM stay petition and despite resubmission of the NAM petition for Ms. Tenenbaum's vote, no further vote has been docketed. No hurry, it seems. I fear that issuance of this "final" guidance may provide the necessary political cover to reject the NAM stay petition, which would be a shocking failure on the part of our government. I will admit I am growing quite tired of this terrible game. We provide a lot of jobs and add a lot of value through our products in American schools. For this, we seem to be public enemy number one and are also treated like dirt. I fail to grasp what we have done so wrong to deserve this kind of discourtesy. It would be great if the agency would elevate its consideration of the impact of its actions, and inactions, and give law-abiding companies a reasonable opportunity to actually participate in an open process (with real listening on the part of the CPSC) and a reasonable opportunity to transition to new rules that are CLEARLY not an emergency. The game play of waiting for guidance until the 11th hour (or later) is no way to run a country. Well, maybe it's a good way to run a Third World country . . . .
Cassandra that I am, I have been warning of many problems with the CPSIA for many months. It's a long list, I won't bore you. Among my bitter complaints are the CPSIA's wild penalty provisions and open-ended liability provisions. [Others have also written about the penalty provisions.] I have gone further and noted that since the law is so complex and overarching, the CPSC will be accumulating claims against everyone and will be able to pick and choose who to penalize, when and how. This process won't necessarily be fair or even-handed. The possibilities for coercion and abuse in assessing liability are rampant and obvious. At ICPHSO, Gib Mullan warned that penalties would be expanded significantly. Yeah, yeah, blah blah blah, right? Worrywart . . . .
Well, you decide. In recent days, the CPSC began to announce its penalty assessments for past lead-in-paint recalls. First, Mattel was forced to pay $2.3 million in penalties (95 items, 2 million units, @$1.15 per piece in penalties). [Of course, Mattel also previously paid millions of dollars in penalties to California and to a consortium of 39 States for the same recalls, but who's counting . . . .] Then OKK Trading was cited and paid a penalty of $665,000 (repeated violations over several years for several reasons). Earlier this week, the CPSC resumed its activities, citing nine companies ($530,000 in penalties, 13 recalls total). I understand there are more penalties in the hopper right now. Here are a couple facts before we dive into the merits of these cases. First, did you know the CPSC has a FIVE YEAR WINDOW to impose penalties? Yessiree, that's the statute of limitations. It doesn't MATTER that they imposed a recall on you or even that the case is CLOSED. Nope, the penalty window remains open. Second, it's the Legal Department, not the Enforcement folks, who set the penalty numbers. My understanding about these last nine cases is that the penalty numbers were NOT negotiable, and if you protested, you were told that a mega investigation would ensue with subpoenas and a risk of referral to the Department of Justice (you know that that means). Of course, any idiot would realize that legal fees ALONE would eat up the proposed penalty in mere days if you were to choose to fight, and then you would still be left with a potentially yawning legal mess. In other words, the CPSC's deal is "Pay or else". That's due process under the CPSIA nowadays. Before we overreact, let's see what these latest penalty assessments are all about. Perhaps there is a pattern here. Cardinal Industries: One recall of a toy jewelry sold in vending machines, 900,000 units, penalty of $100,000 ($0.11 per unit). NO INJURIES. Dollar General Corp.: Three recalls (1, 2 and 3), 494,000 units, penalty of $100,000 ($0.20 per unit). NO INJURIES. Family Dollar Stores, Inc.: One recall, 142,000 units, penalty of $75,000 ($0.53/unit). NO INJURIES. It's not clear from the Settlement Agreement how FDS's problem was discovered. Same "knowing" citation on the same grounds. Hobby Lobby Stores, Inc.: Two recalls (1 and 2), 23,000 units, penalty of $50,000 ($2.17 per unit). NO INJURIES. It's not clear how HLS's problems were discovered. Same "knowing" citation on same grounds. First Learning Company, Ltd.: Two recalls (1 and 2), 24,400 units, penalty of $50,000 ($2.05 per unit). NO INJURIES. The CPSC found one of the recalled items in a retail sweep. The means of discovery of the other problem is not clear. Same "knowing" justification. Michaels Stores, Inc.: One recall, 310,000 units, penalty of $45,000 ($0.145 per unit). NO INJURIES. Michaels was turned in by the University of Ashland. They were cited for the same "knowing" violation, same justification. A&A Global Industries, Inc.: One recall of bracelets sold in vending machines, 4,000,000 units, penalty of $40,000 ($0.01 per unit). NO INJURIES. Raymond Geddes & Co.: One recall of a pencil pouch with lead paint on the zipper pull, 84,000 units, penalty of $40,000 ($0.48 per unit). NO INJURIES. RG may have turned itself in (not entirely clear). Same "knowing" citation, same justification. Downeast Concepts Inc.: One recall, 18,000 units, penalty of $30,000 ($1.67 per unit). NO INJURIES. DCI self-reported this problem as required by law and by good corporate citizenship. Same "knowing" violation, same justification. Every one of the companies denied the "knowing" violation, for whatever good that did them. Not ONE of these companies was hit with the minimum penalty (that is, the lowest penalty above refraining from imposing any penalty), even the ones who turned themselves in or the one with a dab of paint on a pouch's zipper pull. To me, these cases seem like "ordinary" breaches of the L-I-P ban. There is no indication from the publicly available facts that these are "bad" companies or that any of the cases show a pattern of abuse or disregard of the law. Several of these companies clearly were actively trying to make amends for their own errors. The penalties do not seem to correlate to corporate behavior nor do they suggest a formula for determining penalties. The amounts seems random and capricious to me. As noted above, the companies were effectively denied the right to negotiate a penalty on any basis (such as presenting mitigating factors). It appears that the philosophy of these penalties is one of absolute liability (you are liable for a penalty if you violate the L-I-P ban, regardless of reason or circumstance). This is an an entirely new way for the CPSC to administer this law (and excessive, unrealistic and unfair in my opinion). It also seems clear that mitigation for acting promptly and cooperatively or for the absence of injury is no longer relevant in the determination of these penalties. NONE of these cases involved injuries or death. As I have previously noted on several occasions, only ONE recall for L-I-P in 2007-8 resulted in an injury (one injury only) and NO deaths. The good faith cooperation of several of these companies is described in their Settlement Agreements. Can you begin to connect the dots here? In my comment letter on the CPSIA penalty provisions (linked above), I opened with this suggestion: "We strongly urge the CPSC to reserve the imposition of penalties for only the most egregious and dangerous situations. Penalties under the CPSIA should NOT be to punish but instead to motivate better legal compliance. This is consistent with the mission of the CPSC - to protect the public. Notably, the CPSC does not have a mission to mete out 'justice' so the use of penalties should be purposeful and not motivated by retribution. . . . We are fearful that the power to impose high penalties will be used coercively by the CPSC, ending any notions that law-abiding companies can work openly and in partnership with the CPSC. At present, the CPSC encourages a practice of 'when in doubt, file'. In a regulatory environment where minimum penalties are $100,000, how many companies will take up the CPSC's suggestion to file 'when in doubt'? " This letter was submitted to the CPSC on December 17, 2008. Now we know where the CPSC stands on my advice. Near the end of my comment letter, I made the following observation: "All in all, the CPSC must be very careful to not create a menu of 'gotcha' penalties. The CPSC's penalty policy or rules will be part of the 'game play' between the regulators and the regulated companies. If the rules encourage cooperation, the CPSC has a chance to partner with industry to improve safety. If industry believes that penalties are viewed as a revenue source or are being handed out in a way disproportionate to the infraction, then interplay between industry and the CPSC will change for the worse. If the penalties are too great, companies will exit the business (find something less regulated to do) or start hiding infractions as a survival technique. This outcome would not contribute to the safety of American children, and must be carefully considered in crafting the CPSC's penalty policies." The dark clouds are gathering, guys. I am not sure how much more evidence is needed to prove that the cards are stacked against industry under the CPSIA - notions of "common sense", fairness or equity seem to have no place in a CPSIA world. If you think this is a great development for your business or your market, then rub your hands in glee - you are getting your wish. If you think the CPSC is going to too far or the rules empower the agency too broadly, I think you may want DO SOMETHING ABOUT IT. The few of us engaged in pushing back on this law CAN'T DO IT OURSELVES - we need your help. Get out there. Before you get whacked by a vengeful government . . . . The TIA has published an analysis comparing first quarter and first half 2009 CPSC toy recalls against comparable period statistics for 2008. Total recalls are down 75% in the first quarter and 60% in the first half of this year. The comparison by units recalled and by category of recall is equally impressive. So what does this mean? My guess is that the fundamental problem unearthed in 2007/8 was . . . compliance issues. There was NO safety issue, there was no defect in the law, there was no problem with a hobbled agency. This was, plain and simple, a case of companies ignoring or being ignorant of the law. There were also a couple of notorious and avoidable quality control breakdowns. Now, with the microscope placed over its head, the toy industry's safety issues are basically gone. Don't forget that this miraculous recall reduction occurred during a period in which the legal standards were still unchanged (first quartner 2009) and entirely in a period in which product testing IS STILL NOT REQUIRED. Does that suggest the possibility that the strictures of this law are OVERKILL? Well, I think so. What would work fine is the prior law with better administration. Among other things, the penalties should be reconfigured (certainly to eliminate felonies except in the most egregious cases) and the self-reporting on violations should be scaled WAY BACK. The ASTM F963 standard should be also returned to voluntary status to keep things simple and focused from a regulatory standpoint. Lead-in-paint testing should REMAIN mandatory but a materiality standard (or official practice) should be adopted for violations. Most importantly, the agency should recognize the need, the absolute URGENCY, of a liaison function with industry and of an educational mission. [This is old news.] The CPSC must take control of awareness of its rules and invest in better compliance through an enhancement of its relations with industry. Becoming the "cop on the beat" will NOT work to motivate compliance - it will motivate fear and loathing, deception and non-compliance. Good safety practices are economic for industry - because bad safety practices leads to high and unbudgeted expenses from tort and recall liability and higher insurance costs. It's in everyone's interest to behave responsibly, as long as the rules are reasonable and tailored to the need. The educational investment is no less pertinent than it is for the "Click It or Ticket" campaigns. This can be the salvation of the agency - and the children's product industry. As Congress heads toward hearings on the CPSIA (finally), these new statistics deserve attention and analysis. A common sense approach to fixing this law can save a large industry and an important agency of the federal government while preserving the gains in compliance earned in the last two years. CPSIA - Do-Gooders Playing a Role in Train Crashes? Consumer Groups, media and panicky politicians led a feeding frenzy last year over toy recalls that resulted in remarkably broad legislation restricting the presence of lead in children's products, yes our old friend the CPSIA. Of course, the determined "do-gooders" in the consumer group corner have asserted that there is "no safe level" for lead and thus, it makes "sense" to eliminate it totally from children's products (and the world at large, if possible). Remember, you can't be too safe . . . . A leader of this charge was a staff person at the American Academy of Pediatrics who presented unchallenged statistics in September 2007 to a House Subcommittee. With the lilly-white AAP backing of this notion, Congress swung into action and outlawed lead effectively from all children's products. Sounds good, right? Well, as with most manias, the "unintended consequences" have been terrible. This has been well-documented in this space. Interestingly, I found an article recently that suggested that elimination of lead from circuitry (solder), courtesy of our friends in EU bureaucracy, may have played a role in the recent terrible Washington, D.C. Metro train crash. [Lest we forget, it is worth noting that the motivation behind the EU's elimination of lead from solder was protection of the environment, not a fear over direct human poisoning, the basis of the current U.S. mania.] This article points out something that the amateur scientist fear mongers may not have known, which is that lead plays a useful role in solder, and in its absence . . . more "unintended consequences". In this case, the consequence is something called "tin whiskers", a phenomenon created by "untamed" tin in solder. Tin behaves differently in the absence of lead, and will grow "whiskers" that create electrical shorts. The article suggests that this explains the intermittent electrical failures of the crash detection system on the Washington Metro. Other deadly accidents have been linked to tin whiskers. Precautionary, indeed. Among the many things that disgust me about the lead mania is the illusion (delusion) that controlling lead-in-substrate in children's products will have any material impact on exposure to lead. In fact, it's just a way to put blinders on. By publicly and notoriously addressing the "lead problem" - problem solved!! This is absurd, of course, but has only encouraged the maniacs. Take, for example, the recent hubbub over the Obama's "lead-contaminated" vegetable garden. Incredibly, the lead levels detected in the White House garden (presumably by people with too much time on their hands) was 93 ppm. Our dear friends at the AAP assert that background lead levels in dirt is 40 ppm. This was the rationale behind the recent Illinois lead labeling legislation profiled in this space. As the Obama article makes clear, the controversy over lead in dirt is just politics, not science, and is WAY out of proportion to both the health threat and the presence of lead all around us. Dr. Kimberly Gray, Director of the Environmental Sciences Program at Northwestern University comments: "It’s inflammatory. 93 ppm is well below background lead for an urban environment. It’s what you’d expect just from atmospheric deposition." The article continues: "Atmospheric deposition is lead particles that fall out of the sky, from things like auto emissions." You mean there's lead in the air, too - oh, no! The do-gooders have infinite justifications for their bans of lead in children's products, their current obsession, but (other than economic devastation) what has actually been accomplished for the American public by their handiwork? Only the illusion of "better safety". The legislation markets the idea that elimination of insoluble lead from substrate makes a marginal, incremental difference to health, as though it were the only (or principal) source of lead in our bodies. This flawed logic also underlies the dangerous Proposition 65 in California. The labels required by Proposition 65 sounds sensible, intended to advise consumers of the presence of "toxins" in their products (even if legally there) so they can decide whether to expose themselves or their families to the "deadly" substances. Who could object to that? Well . . . the selective presence of these labels gives false comfort to consumers who may believe that the labels highlight the ONLY places where the noted risk occurs. The implicit reasoning goes like this . . . why would the government require lead labels on lip gloss if the government knows that this risk is miniscule compared to MANY other sources of lead in daily life? Aren't they requiring labels on EVERYTHING with lead? And, if so (the government wouldn't let us down! ), isn't this buying decision critical, a highlighted choice that might make the difference between good health and some form of miserable, painful, lingering death?! That's the implication, however erroneous. I do not accept that this is the only way to run a sensible society. Canada has attempted to truncate our fancy new safety system, by tailoring it to a narrow and specific class of products or situations. That seems like a good place to start. It's time for all concerned to acknowledge that the "perfect legislative process" had a faulty outcome. Real leaders are prepared to admit error and to do the right thing for their troops. Congress??? CPSIA - How to Solve Your Problems! Q: "My Company is straining to survive in tough times, and someone told me that because our products are modified by downstream dealers, I might be liable to comply with this law. I have never tested my items, which are known to be safe, but now I understand I will have to test and even label each item by lot. I don't want to do that, and can't figure out how I would afford it. Mr. CPSIA Answer Man, what should I do?" A: This could be a major bummer for you, my sad friend. Under Section 3(a)(2) of the CPSA, your products would be subject to the new strictures on lead and tracking labels if they are "children's products", that is "a consumer product designed or intended primarily for children 12 years of age or younger". Hmmm, that could be just about anything. The CPSC has clarified this to the opacity of mud. Consider the many unanswered questions of the Promotional Products industry on this very topic, where companies sell "blanks" that are later modified and resold, possibly as items suitable for children. So let me answer your question with a question: are you one of those small-minded individuals who craves certainty and cannot abide by guessing or living in the shadows? I hope not, because if you are, you will find yourself compelled to pretend all aspects of the law apply to you. After all, having read the pen stay decision, it appears to be a judgment call whether an item is designed or intended "primarily" for children. And in the world of CPSIA judgment calls, you are encouraged to make the right decision - as determined by other people after the fact. If you conclude that the law MIGHT apply to you, and can tolerate the risk of any of 51 organizations (the CPSC and 50 States SAGs) coming after you, you should adopt the now common approach to dealing with the CPSIA - non-compliance! Yes, it's low cost and gets the job done with very little bureaucracy. It's one of life's little ironies that this law, intended to facilitate tougher regulation of safety, actually ENCOURAGES non-compliance. Our dear friends in the Consumer Group community know it, too. I am not exactly sure what Congress thought it was accomplishing with this new scheme, other than economic devastation, but heck, I always knew I wasn't smart enough to be in government. Q: "You have GOT to be kidding. When my dealers call up to assert that the law applies to me and to force me to absorb new costs and responsibilities, what am I supposed to tell them?" A: Now THAT'S a good question. Mr. CPSIA Answer Man has tried several approaches, such as claiming to not speak English, wrong number, out to lunch, etc. These strategies don't seem to work very well. Unfortunately, our friends in government have not left you with much to say. You have your fig leaf, and need to bob and weave to convince your customers that your approach would stand up if tested. These debates are usually settled on the basis of economic power. Oops, you lose! This raises one of the delicious ironies of this new law. If you are hiding behind a tiny fig leaf and are getting pressure to move into a safe harbor, what can you do? Sometimes, the law's designated safe harbors (such as lead substrate levels of 300 ppm as of August 14 or TRU's 100 ppm limit as of January 1) simply means you must exit your market, which may not be an option for any number of reasons. I am going to assume that safety is not a real concern for your products, since it has been made clear that only a tiny percentage of children's products ever get recalled. Since Congress wants the CPSC to act with "common sense", is there a way to make a case for such safe products to get into that safe harbor? The answer is NO. The law does not allow exceptions. The only exemptions possible under the law are for products that ("on the basis of the best-available, objective, peer-reviewed, scientific evidence") cannot possibly introduce so much as ONE atom of lead into the body. Thus, you get exempted if you can prove it never applied to you in the first place. SAFETY IS IRRELEVANT. Ouch! Mr. CPSIA Answer Man wants to remind everyone that none of the foregoing has anything to do with safety. We all have a responsibility to our customers to behave honorably and with a sense of duty when it comes to safety. You should always do the safety testing necessary to satisfy yourself that it is safe and appropriate to sell your products, and need to take into account everything you know when you make that judgment. Control of your supply chain is a big part of how you will achieve this. No matter what you conclude in your administration of CPSIA survival, you can never lose sight of your safety responsibilities. Q: "What if one of my dealers takes it upon him/her to test one of my products that I have concluded is OUTSIDE the law's confines? What am I supposed to do if they show me the report? What if they demand that I recall the product based on this unnecessary, irrelevant and possibly erroneous test report?" Q: "This is turning into a blood pressure incident for me. I don't believe this blather you are spouting. Where are the rules and regulations so I can read them myself?" A: Mr. CPSIA Answer Man does not wish to frustrate! Here is the CPSC's highly touted CPSIA website, see if you can find the rules and regulations yourself. Of course, don't forget to look at the FAQs, which are treated with the seriousness of regulations (until they aren't). Also, you should check out the letters of the General Counsel, but they don't always hold up and aren't the equivalent of a Commission decision (in other words, the Commission can back away from the GC if it wants to). And if you are really resourceful, you might try to find an unpublished CPSC or GC letter to a company on its products that holds a clue for you, or perhaps pick up a useful voicemail from a CPSC staffer along the way that seems to shed some light. Sadly, nothing is really obvious in this arena, since there is no way for the CPSC (or anyone, frankly) to regulate such a vast array of products and have sensible rules that apply to all of them - so you will need to hire experienced counsel. Gather all the experts around a table and see what conclusions you come to. If you have more questions, Mr. CPSIA Answer Man remains at your service! Q: "The testing costs are going to kill me. We can't afford all these tests because our items generate too little volume to bear the cost. Interestingly, we also don't see much value in purchasing test reports whose results we know before we pay the money. If I really have to bear these unnecessary costs, I will have to gut my product line - and fire some people. My customers want these products, too! What should I do? Also, I know I don't have to test (yet) but am responsible to be compliant with the lead limits. How do I make sure I comply without testing?" A: I am so glad you asked this question, as it is on so many minds these days. We already covered the fact that an exemption for you is unlikely. Some people want to allow component testing. This sounds good, and for manufacturers of the simplest items, it may work fine. Unfortunately, no one seems to have thought through how a system based on component testing would work. A few "stumbling blocks" might include: (i) incomprehensible test reports (don't correlate or can't be correlated to the finished goods), (ii) reversion to the old "trust me" safety system but with more bureaucracy and cost, (iii) uncooperative component manufacturers who aren't legally required to provide test reports (think of the low volume fabric that is sold in your neighborhood sewing shop), and (iv) ever-finer gradations of components makes the testing scheme into a laughingstock. As usual, all roads leading to Rome and all that, the issue of what is safe and what is not becomes relevant again. You will not be allowed to argue for an exception based on the safety of your products (socks and underwear?). The rules are blind to safety or risk assessment. Unless and until the law is trimmed back to something more reasonable and appropriate, a la Canada, you better figure out how to finance your testing burden starting with lots made on or after February 10, 2010. The banks are getting healthier - perhaps you can take down a big fat loan! As to complying without testing, that's a rather metaphysical requirement of this law. Aren't those folks in Congress sneaky?! Wow, if I only had their cleverness . . . . This is the same thinking that underlies their choice to make 600 ppm lead-in-substrate legal from February 10 - August 14, 2009 and then instantly turn it into illegal, dangerous contraband. I wish I could fathom the "logic" of that one. After all, they specifically set the February 10th limit and authorized it for sale, which suggests that they believed it was safe enough to fob off on the American public. Well, it makes a satisfying sound bite at least. I think the requirement to comply while staying the testing requirement is just another compromise on the way to, well you know where. There is no logic to it. You can use supply chain management, selective testing, comprehensive XRF studies of your product range and business judgment. Even this won't work for all of you. Non-compliance anyone? Q: "My greatest fear is those darned tracking labels. I can't identify my sources on my products, no matter what the Federal government wants. I might as well turn in the keys for my business. Is there ANYTHING I can do? Is there ANY guidance I can hang on to?" A: The CPSIA Answer Man shares your concern. Today is July 7 and with the tracking labels requirement due to become active in a mere 39 days, the CPSC has yet to so much as float a single sentence of advice. Well, except for Commissioner Moore, who is looking forward to a delightful "learning process". He seems to think that if guidance is put out sometime before the August 14 deadline (August 13, perhaps?) for the crafting community, all would be well. I take it you are not a crafter. Ouch! Many comment letters have been filed with the CPSC on tracking labels, including mine, which set out concerns like yours. The issue of confidential sources has been highlighted as a "deal killer" yet the CPSC remains silent. Notably, at the ICPHSO conference in February, the General Counsel specifically addressed this point and told the audience to "get past the mourning process" because Congress wants source information to be publicly available. So I guess you should probably begin to hang crepe, if you are to take this advice seriously. For what it's worth, the NAM petition to stay the tracking labels provision was recently refiled. Hope springs eternal. Let's hope the Commission acts with "common sense" and pushes the day of reckoning on tracking labels far off into the horizon. CPSIA - Who Will Stop the Insanity? CPSIA - Lead Labels, Who Cares?